You can have everything you wish handcrafted from pine wood. 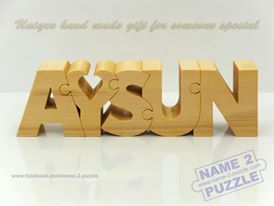 Just choose the wooden puzzles and your gift will look amazing. The gifts are handmade from pine wood and are polished with olive oil. They are the most amazing gift because of their personalized idea. Just choose what you want from pine wood and you will put a smile on every face with these wooden gifts.